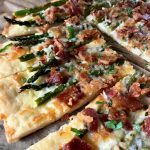 Cheesy Bacon and Asparagus Flatbread is such versatile recipe! You can make it as an appetizer or for breakfast, brunch, or dinner! 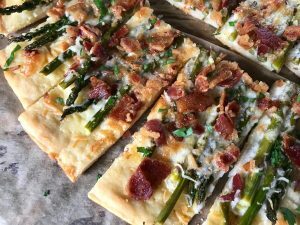 The flatbread is made from scratch and couldn’t be easier using the two-ingredient dough method as a base. 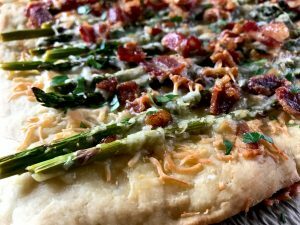 Topped off with asparagus, bacon, and mozzarella. It’s great for any day of the week, but fancy enough for a Holiday event! Hey there! Happy Easter week. I’ve got a delicious lil’ recipe gift for ya this week. I’ve been working on a few different brunch-y type recipes over the past few weeks and weeeell, you know, because I am me and I take forever to recipe test and perfect things I didn’t get multiple ones done to share with y’all for Easter like I wanted to, but what I did get done is this drop dead delicious Bacon & Asparagus Cheesy Tart! Y’all are going to LOVE, LOVE, LOVE it! I mean, as long as you like asparagus. Which I really hope you do because man alive, this is good stuff. 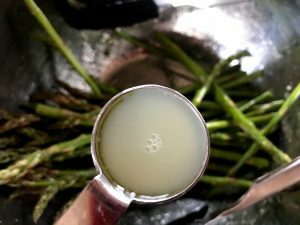 Asparagus season is HERE! Which is such a good season in a month or two we’ll be going out to “Asparagus hunt” around the fields of Eric’s family farm. It grows wild in a few different patches and it is such a TREAT. 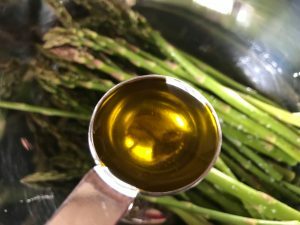 Truthfully, I never liked asparagus until Eric picked some wild asparagus for me and we grilled it up one summer night many moons ago. It’s now one of my my favorite things. 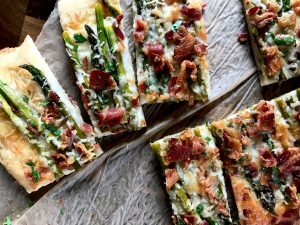 This Bacon & Asparagus Cheesy Flatbread is perfect for brunch! It’s even more perfect for Easter Brunch! And It’s perfect for dinner! It’s perfect for a midnight snack. It’s just pretty dang perfect. I served it the other morning with my signature lazy girl scrambled eggs and a fresh fruit salad. It was a hit! Pepper questioned the asparagus bits for at least 15 minutes, but after pleading with her to try it she did and her eyes got a bit wide and she said, “NOMMIES!” which translates to “ma- this is delicious. I’m nuts for throwing the other piece at the wall before trying a bite. I’m sorry for doing that.” I don’t make my kid clean her plate or eat if she says she’s full, but I do make her try a bite. If she said she doesn’t like it, fine, but in my house, you try a bite or you’ll sit at the table till you’re 35 years old. 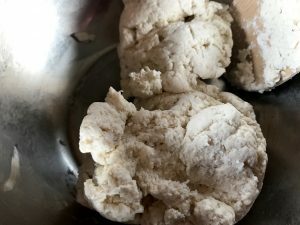 Are you wondering what the dough is made out of? It’s the two ingredient dough stuff! Well, kinda. It’s the basis of the two ingredient dough. I added a few things to make a bit more delicious including just a bit of butter- just to give it more delicious flavaaa. It’s just a little and it’s so yummy! You can omit the butter just so ya know, but a little butter is good for ya, baby. Is it okay if I call ya baby? okay. 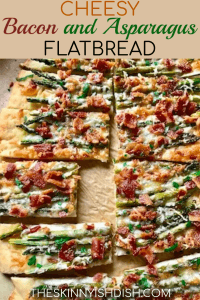 This flatbread is dreamy and so easy to work with. Truthfully, the first time I made it I ate the entire thing over the course of the afternoon. Haha! It’s so good. I slice it into 9 servings usually because it was created with the intention of being a side dish for brunch, but by all means, you can eat half..or um, the whole thing. It actually really won’t break the bank calories and/or points wise if ya do. You’ll love it! First… An Easter photo of little Pepper. This little girl is my heart and soul, y’all. She’s the sweetest thing in the world. I am so lucky to be her mama. 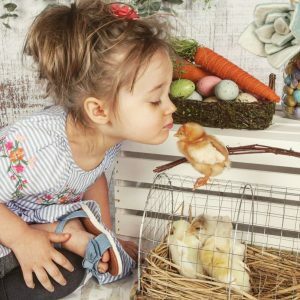 I took her to get her photo taken with baby chicks the other day because I knew she’d just have a lil’ cow being able to see the little chickies and hold’m. Our baby chicks are almost full grown now and she loves baby animals, baby toys, baby dolls, “baby” bugs.. and baby legos. (Did I just say baby legos? Yep, I sure did. This kid loses her mind over tiny lego pieces.) When I say she’s the sweetest, I mean it. Her heart is so pure and simple and perfect and I don’t want her to ever find out that baby chicks and chicken nuggets are the same thing. Okay okay.. let’s get in the kitchen! When the first step is bacon y’all know it’s gonna be a good day. So- you’ll need some center cut bacon- 5 pieces to be exact. You can prepare it anyway ya like. I throw it in the oven at 400 for about 18 minutes and do other stuff while it cookin. You can put it in a skillet too. Just make sure it’s nice and crispy, but not burnt. I personally have fallen in love with the oven method because it’s hands off and I don have grease splatters to clean up. 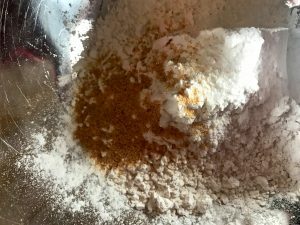 Grab a mixing bowl and add 1 and 1/4 cups of self rising flour, 1 tsp garlic powder, and 1 tsp kosher salt. It’s important that you use kosher salt for the measurement I give because otherwise it will turn out super salty! Reduce the amount of salt if using regular salt. Stir together real quick. You’ll need 1 tbs cold butter and a cheese grater. 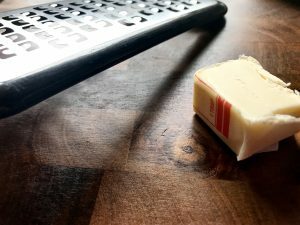 Throw the butter in the freezer for a few minutes before doing this just be sure it’s cold. Okay? Okay. 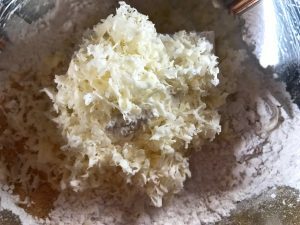 Grate the cold butter into the flour. You don’t have to add the butter to this, but I really, really, really recommend it. Mix it up well with a fork. Now, let’s add 1 cup of non fat plain greek yogurt. Stir it up REALLY, REALLY, REALLY, REALLY GOOD! 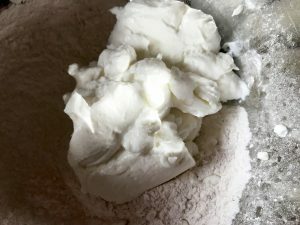 You stir basically until there are no lil flour bits at the bottom or sides of the bowl and the dough kind of forms into a lump. 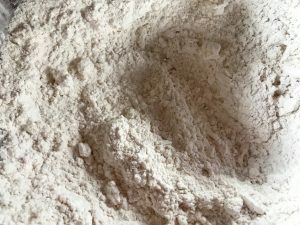 Sprinkle a few pinches of flour onto a smooth clean surface. 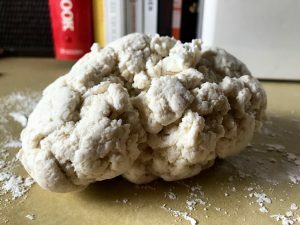 Doesn’t the dough kind of look like a brain? 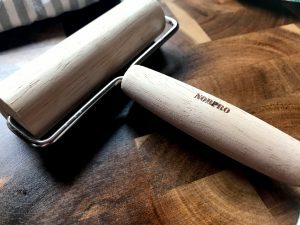 You’ll need to knead (ha!) the dough probably about 25-30 times and that’ll make it look nice and smooth and not so brain-like. While it’s still on the counter I start to roll it out, just to get a head start, really. Sprinkle a bit of flour on the roller. Literally like a pinch and rub it around. THEN, I transfer it to a sheet pan that’s lined with some parchment paper and roll it out until it’s fairly thin and in a rectangular shape. I didn’t measure, but I’d say it was probably about 10 inches by 5 inches? Maybe? It doesn’t need to be perfect- truly. Alright, I know this might seem like it’s a lot of steps, but I really do promise that it couldn’t be any easier and it honestly takes about 5 minutes total if even to get the dough prepped. Next you’ll wanna take a fork and prick the dough ALL over not hard enough to make actual holes though. Then, spray it with a bit of butter or olive oil cooking spray. I prefer butter cooking spray with this, but it’s up to you. Prebake the flatbread in a preheated 425 degree oven for 5 minutes. Now, the asparagus part! Add 1 tsp of olive oil, 1/2 tsp garlic powder, and 1/2 tsp kosher salt- and a bit of freshly ground black pepper. And add a little lemon juice! I added 1 tablespoon. I think it just gives it a fresh spring-y deliciousness. Truthfully, you don’t have to do this part. I forgot to do it one of the times I made this up and it was still delicious. Now toss it all together real quick. 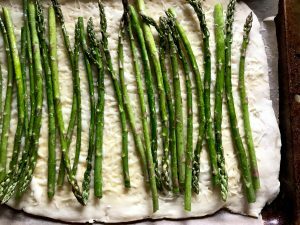 Now, you’re going to evenly sprinkle 1/2 cup’a mozzarella cheese over the dough, THEN add your asparagus. As you can see I used about 22 pieces of asparagus. You can add more or less, really. It’ll also depends a bit on if ya get the thicker asparagus. I personally always look for bunches of asparagus that have the really thin asparagus stalks. They are much, much better than the thick pieces. Also, as you can see it’s not perfectly rolled out or in a perfect shape. Just sorta kinda rectangular and about 10×6 inches? maybe? It’s a rustic and beautiful type of flatbread. 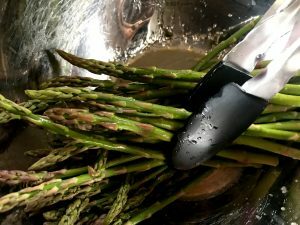 One more thing, you need to break each asparagus spear individually near the bottom of the spear. It’ll snap where it wants to if you let it naturally bend. It’s the best way to do it! If you don’t do it. It’ll be chewy and unpleasant at the bottom of every spear. 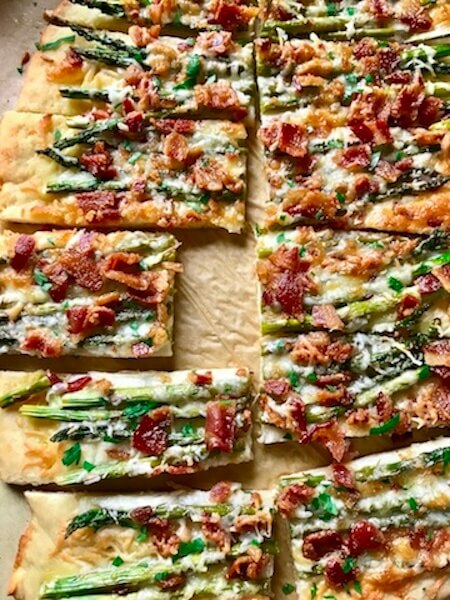 I forgot to take a photo, but chop up your peices of bacon or crumble them, whichever works, into small pieces and sprinkle them on top of the asparagus, then cover the asparagus and crumbled bacon with another 1/2 cup of mozzarella cheese. Spray the whole thing with some butter or olive oil cooking spray. Pop back into a 425 degree oven and bake until crust is golden brown around the edges and cheese is lightly browned. It should be about 18-20 minutes. And here it is, isn’t it pretty!? Here’s a close up of this delicious beauty. Cut it into 9 slices and throw it on your table. I really love this not only because it’s delicious, but because it’s honestly really easy and it looks so much more sophisticated than it actually is. 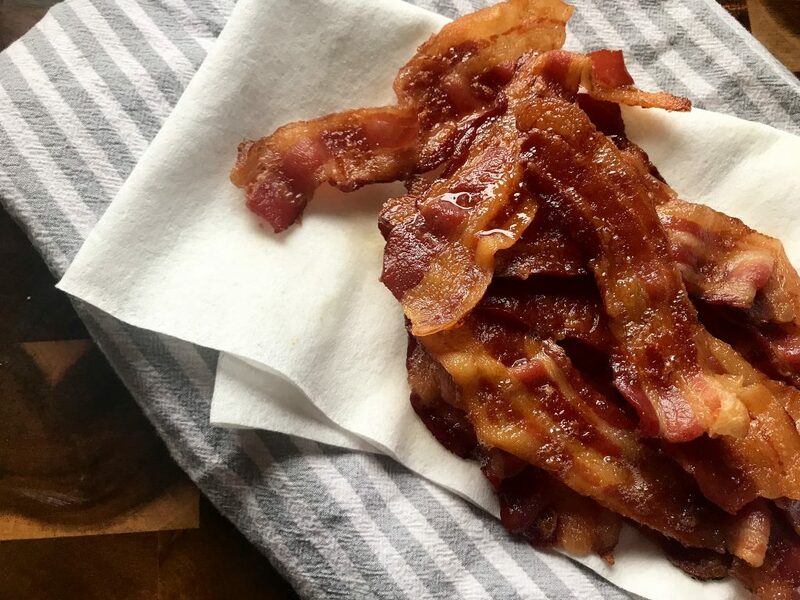 Seriously, if you know how to fry bacon and preheat the oven you can make this. And instantly impress every person at Easter brunch! 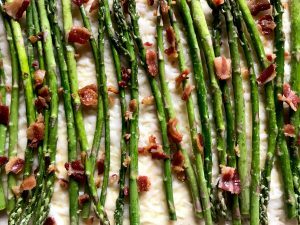 I am posting this for you to make for Easter as a side dish or an appetizer, but in all honestly, make this any day of the week, special occasion or not, because it’s just the greatest thing! 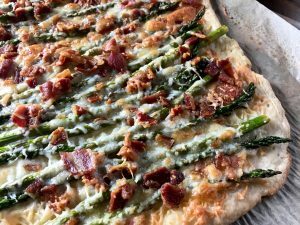 Fresh asparagus tossed in spices, lemon, and olive oil, crispy bacon, and mozzarella cheese piled onto a from scratch easy rustic flatbread perfect for Sunday Brunch! Preheat oven to 425 degrees. In a bowl add self rising flour, kosher salt, and garlic powder. Quickly stir together. 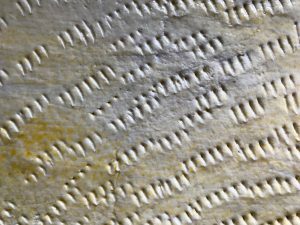 Using a cheese grater, Grate 1.5 tablespoons of COLD butter into the flour mixture. Stir together well with a fork. 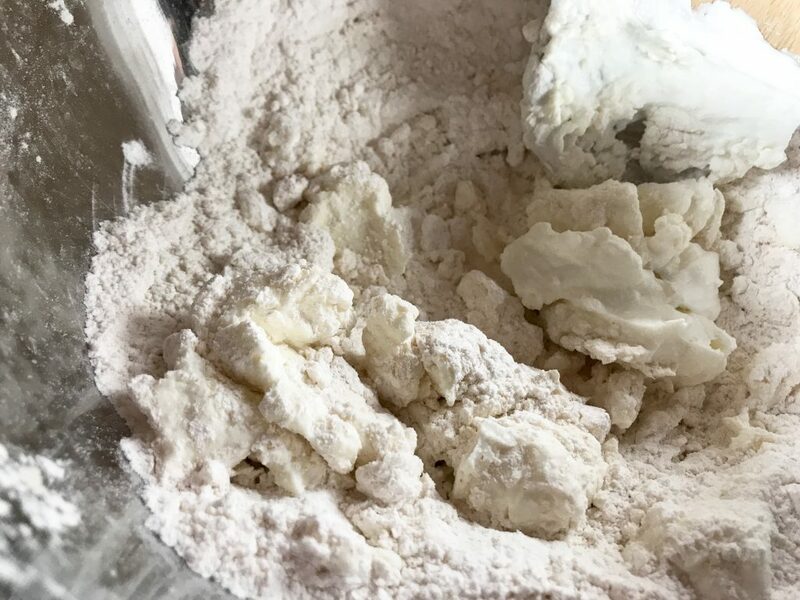 Add greek yogurt and stir with a wooden spoon until completely combined and there are no flour bits and pieces on the sides or bottom of mixing bowl. The dough will form a lump inside the bowl. Sprinkle clean and smooth surface with a couple pinches of flour. 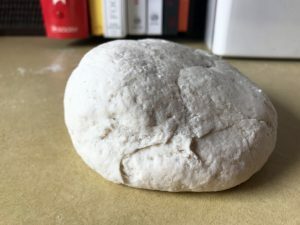 Lay flour on it and knead the dough 25-30 times until it forms a nice smooth ball. 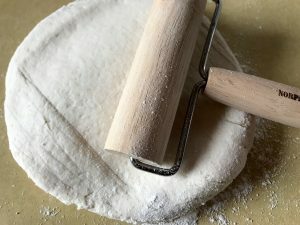 With a rolling pin, or preferably a pastry roller, roll out the dough little. Then, place onto a sheet pan that is lined with parchment paper. 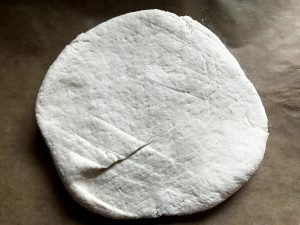 Roll out the dough to resemble a rectangle. It needs to be about 10x5 inches. When dough is rolled out thin and evenly prick with a fork all over, but not hard enough to create holes in the dough. Spray with butter cooking spray. Place in oven and prebake for about 5 minutes. 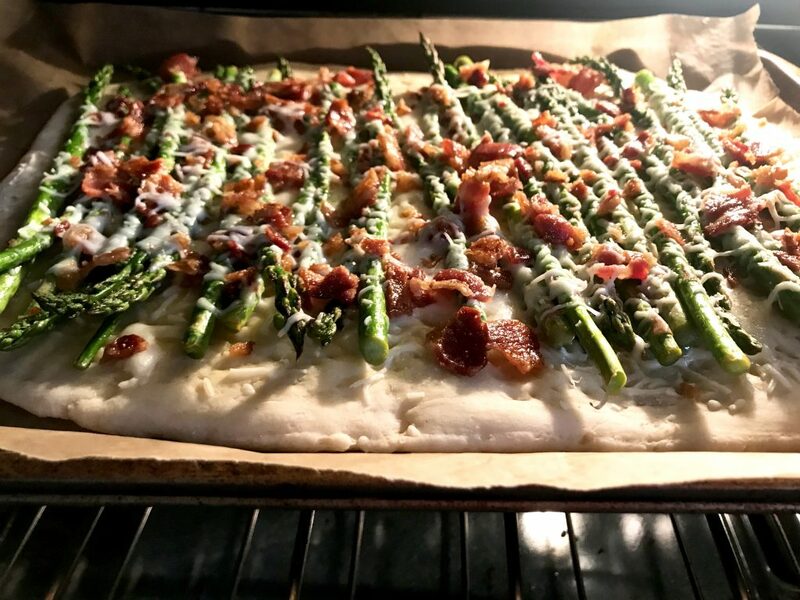 Remove from oven, sprinkle 1/2 cup mozzarella cheese on top, place asparagus spears on top of that, then crumbled bacon, followed by the rest of the mozzarella cheese. Spray the top with a bit of butter cooking spray. Bake for 15-18 minutes or until the crust is golden brown on the edges and the cheese is melted and golden brown. Enjoy! Can you please clarify the amount of butter? Both the post and the ingredient list say 1 tablespoon but directions say 1.5 tablespoons. Thanks! ! It’s 1 tablespoon, not sure why I did that. I’ll fix it now. Thanks! Thanks so much! I’m really looking forward to making this tonight! Wonderful! My pizza turned out bigger and I cut it into 6 pieces for 5 points each. Wonderful! So happy you enjoyed, Carol!! Hi! This was so delicious. Made it tonight for dinner. However, when I put everything into my recipes builder, it comes out with 8 points a serving. Wondering what I could have done wrong! Hi there Rosalie!, I’m so happy you enjoyed! I’ll double check things on my end, but it should definitely be 3 points per serving. Sounds like maybe an ingredient was entered wrong because it’s a pretty huge leap from 3 points. Made this for dinner tonight. YUMMO!! I’ll make this again for sure. So happy you enjoyed, Gloria! The sundried tomatoes sound amazing! Amazing-you’ve totally outdone yourself! Love love love!